From here, you can see traffic trends by hour, day, week, or even month. You can set a date range for the overview, and even see basic demographics, browsers, and operating systems of your site’s visitors. The screenshot above tells me a few things right off the bat: traffic dips almost every single weekend, most users are from the U.S., and there was a significant spike in traffic on Friday, April 25th. But what, exactly, caused that traffic spike? The first step is to get a general idea of what traffic is like on a normal day and then do a few comparisons. Let’s start with the easiest: Traffic. My average daily visits to the site (not including Saturdays and Sundays) fall somewhere between 40 and 50. On the day of the spike, however, those visits rose to 83. That means I’m looking for a difference of about 30 visits. 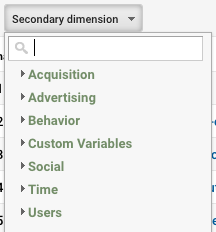 My next step is to select the “Acquisition” tab in the left-hand sidebar and go to “Overview.” This breaks down traffic into four categories: Organic Search, Social, Direct, and Referrals. About half of my traffic comes from organic search, with Direct Traffic as the next largest source (37%). Following that are Social Referrals (9.9%) and Referral Traffic (2.7%). Now let’s compare. Go back to the Audience Overview and select the date(s) of the spike. Again, there’s a clear winner here: an article written by Megan on April 24th about dealing with negative comments and reviews brought the site 17 new visitors, which makes up the majority of the traffic spike. You can also set the secondary dimension to map out the visits by time or (in the case of a multiple-day spike) day. This process could be used on any of the core traffic channels. For social, it tells me which posts people actually liked enough to click on. If Organic Search had been the culprit, I could have seen which pages it was bringing people to—even if it gives me only “not provided” search query keywords. 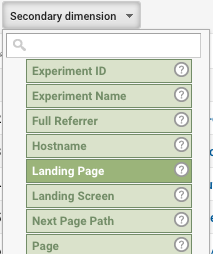 For Referrals, I could see which sites and specific URLs are linking to me and to which pages. Another interesting place to look when analyzing traffic is on the behavior flow chart… but that’s a different topic for a different day. For now, I’ve found my answer to where my traffic spike came from. The next step for me would be to analyze social to find out if that post had more engagement than normal and, if so, why. 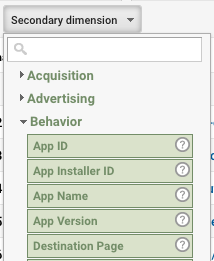 Google Analytics is a fantastic free tool to use, but it can certainly be overwhelming if you’ve never used it before. I hope that this tutorial helps, and if you have any further questions I hope you’ll reach out to us on social media or through email.